Economics and politics continue to dominate world headlines as the United States is coming into the final stage of the 2016 presidential election. Many world economies show signs of continued decline or lack luster growth. Shipping companies are removing ships from service and reducing capacity on key trade routes. Seafarers and the maritime industry play a vital role in the world economy as over 90% of the world’s goods are transported via ocean cargo. 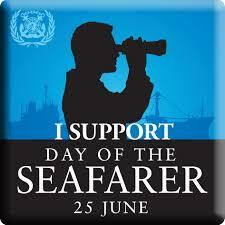 In a couple of days, on June 25th we will be celebrating the Day of the Seafarer. This is one day a year set aside to recognize the significance of seafarers around the world and their importance to the world economic engine. The IMO’s (International Maritime Organization) focus theme this year is “At Sea for All”. The goal of the theme is to highlight the importance of the seafarer to the world. However the actions of the world and even companies within this industry don’t seem to support that theme. Many seafarers work in deplorable conditions for less than a livable daily wage. Many seafarers spend months at sea to support their families with only a few weeks off in between long periods underway. Throughout the recent global downturn we have seen the erosion of this industry and the jobs that support worldwide shipping. Most national governments provide little or no support for seafarers pushing that burden to organizations like the Seaman’s Church, Seafarers Houses, the International Seafarers Union or other trade unions. However these organizations are very limited by personnel, time and resources. We are failing to help support and demand improvements to this industry. Some cargo companies use flags of convenience through multiple shell companies to avoid risk and liability. Many of the flags of convenience provide little or no protection for seafarers or regulatory oversight and recourse for shipboard operations. The international trade unions are constrained by local laws and regulations and don’t always have the ability to protect seafarers. Companies are failing to adequately provide solid risk management programs to empower shipboard crews to understand the risk they could face on a voyage and how to mitigate those risks (weather, piracy, delays, disease outbreaks, terrorism). Expanded training opportunities are not always available to help seafarers improve their job skills and improve shipboard safety. Leaders around the world at all levels need to be held accountable. The seafarer and the maritime transportation industry will be one of the keys to help get the world economy moving forward. It is time as an industry that we come together to make some real changes and improvements. Trade organizations need to come together as one voice and one industry whether it is commercial or pleasure. Everyone needs to get involved to hold politicians accountable to support the maritime industry and the people who make it run. We need to make changes and improvements to laws and regulations at all levels to help strengthen this industry. We need to develop a plan to improve the port and transportation infrastructure to more efficiently move goods and services thereby reducing costs. If the politicians won’t start the conversation it is time for us to make our voices heard. So on June 25th take time to remember, celebrate and thank a seafarer because many of the items you use every day (phones, cars, computers, appliances) came to your courtesy of a seafarer.